Having clean gaskets help your door to seal better. This guide is about cleaning a refrigerator gasket. Did you know that one of the first thing to wear out of a refrigerator is the rubber door gasket? So, with this simple tip, you can protect the gasket from cracking, drying, and mildew. Just apply a very thin coat of Vaseline petroleum jelly. By this simple procedure, you are preforming a preventative for the cracking, drying, and mildew! It also improves the seal! If you are having trouble with ice build-up on the heater coils in the back of an older fridge and are having to go through the lengthy process of removing the food and shelves to defrost with a hair dryer -- a little Vaseline may be all you need! It turns out that the plastic seal around the edge of the door loses its elasticity over time and so may not be sealing as tightly. I got a tip from a repairman that simply rubbing the seal with petroleum jelly will help soften it up. It completely eliminated the problem for me! Never use bleach, diluted or undiluted, to clean refrigerator seals as it breaks down the rubber. I used to, but after 18 months I had to replace the seals. 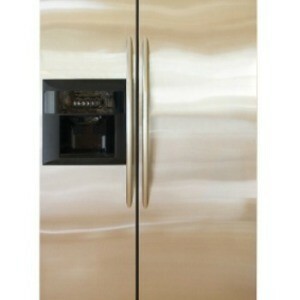 What cleaning solution do you use to clean the rubber around the doors of your refrigerator and freezer? I only ever use some liquid dishwashing soap. I put a squirt on a rag, and wipe the gaskets off, then do a rinse with plain water, and dry them off. I use my home made counter cleaner of water, bleach, and dishwash liquid which I keep in a squirt bottle. Just spray it on and wipe it off. I use a solution of half water, half vinegar. Works a treat! Dawn dish soap first. Apply it directly with a dishcloth and then rinse with plain water. The same can be used for any copper tubing nest. Drying it, and applying a thin coat of vaseline, will keep gasket from cracking. What cleaning solution do use to clean the rubber around the doors of our refrigerator and freezer? I bought a used side by side refrigerator and on the freezer size someone had put, of all things, packing tape on the rubber seal. They did this to keep the seal in place because they had taken the door off and didn't take time to put the rubber seal back in its place correctly. When I pulled the tape off the seal to put the seal around the door properly it was sticky. How do I get the sticky residue from the tape off of the seal? On something that contains food - I'd use vodka - apply and let sit for a little bit. For items like glass, etc. nail polish remover works, and there's a commercial oil called Goo Gone - one bottle will last for years. What is the best way to prevent mold/mildew from building up on the door gaskets of the refrigerator? What is the best way to clean it when it does form? You were very kind to share with the readers that we are NOT to use bleach on the refrigerator. gaskets but I much of missed the 2nd part. How do we clean the mildew and mold off safely with damaging the gasket? Thank you for your help and time. From a house wife who hates mold, anywhere. Connie H.
Hydrogen peroxide. I can't praise this stuff enough. Put some in a spray bottle and spray the mold or if you don't have a spray bottle just pour it on. Let it sit a few minutes. Wipe. You may have to repeat. Can anyone tell me how I can clean the mildew on the rubber seal on my refrigerator/freezer doors? Thanks! I would try Scrubbing Bubbles. In Florida, as you know, we experienced 4 hurricanes last Summer / Fall. Some refrigerators were in terrible shape after several weeks of no electricity and the owners unable to get to them for a variety of reasons. Scrubbing Bubbles to the rescue. I have started using it each time I clean my refrigerator now --- because it gives it such a nice clean look, and I figure the bleach in it can only help sanitize. How do you clean black mold off refrigerator gaskets? I really need to clean it up before company arrives in 2 days. Bleach is very bad for the seals (gaskets). Everyone that uses a bleach product will be buying a new refrigerator, or a new gasket sooner or later. How long have you been using Scrubbing Bubbles? Does it contain Bleach? Any cracks or distorted areas on your gasket yet, bleach users? Does anyone know what the manufacturer recommends?